If you’re touring Europe by cruise ship, there’s a good chance that one of your stops will be the beautiful Mediterranean city of Barcelona. This is one of our favourite cities in Europe, and one we’ve returned to numerous times. If you’re visiting Barcelona by cruise ship, you’ll likely have somewhere between five and ten hours to explore the city. With that in mind, we wanted to put together a guide to what to do in Barcelona on a shorter visit like this, and give you all the information you need to maximise your time in the city. We’re going to give you a detailed itinerary for what to do in Barcelona if you’re visiting by cruise ship, tips on getting from Barcelona Port to downtown Barcelona, some ideas for saving money that are tailored to cruise-ship visitors, tips for getting around Barcelona, and more. Whilst this is focused on cruise ship visitors, it will also work for anyone visiting Barcelona for a shorter trip. Let’s get started. What about a shore excursion tour of Barcelona? This is an itinerary for those of you who want to see Barcelona independently when you visit the city by cruise ship. 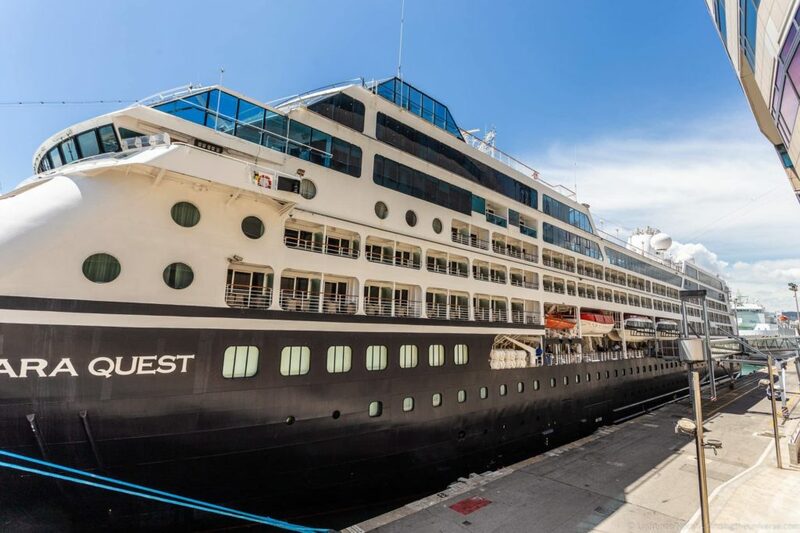 It’s designed to be logically laid out and easy to follow, starting at the main cruise terminals, looping around the highlights, and returning to your cruise ship. It should be doable in five or six hours, but of course you can stretch it out with additional stops if you wish, or spend longer at each attraction (or just enjoying a leisurely lunch with Sangria!). You could also drop some of the stops if you wanted to spend more time at each location. This is really just to give you an idea of a suggested itinerary. This itinerary is based around using the Barcelona Day Pass, a city card for Barcelona which is especially designed for cruise ship visitors, and includes the Portbus, HOHO bus, and timed entry into Sagrada Familia, as well as a 20% discount on many other attractions. More on this in the saving money section further on in the post. The Portbus (see below on section for getting from the cruise terminal to the city) will drop you at the Mirador de Colom, which is at the southern end of the famous La Rambla walking street. 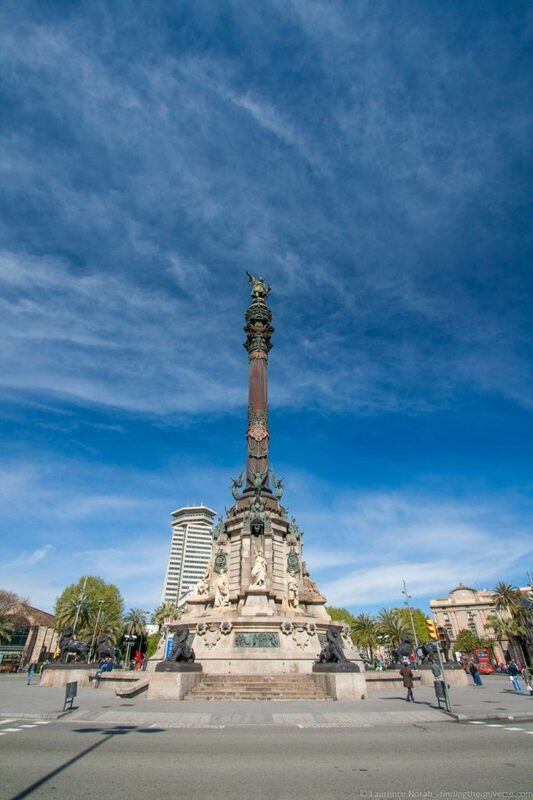 This is commonly known as thePlaça Colom or Placa Colon, which translates as Columbus Plaza, although its official name is actually Portal de la Pau. Still, the giant 60 metre high pedestal topped with a statue of famous explorer Christopher Columbus has become so iconic, that the name Plaça Colom has stuck, named for the statue, which is known as Monument a Colom in Catalan (Mirador de Colón in Spanish, so you might also see it referred to as Plaça Colon). If you want to, you can even climb to the top for a small fee, and get excellent views of the city. If you do this, note the Barcelona Day Pass offers a 20% discount on this, with redemption instructions in the e-mail you will receive on purchase of the pass. It’s from the Plaça Colom that you can get the Barcelona Hop on Hop off bus, which is our recommended way to get around the sights in this itinerary. Before you do that though, and if you have a longer stopover, you might consider visiting the nearby Maritime Museum or the Barcelona Aquarium. The Maritime Museum is found in the former royal arsenal of Barcelona, which dates in part from the 13th century, and is a stunning building of itself. The museum focuses on the rich maritime and ship building heritage of Barcelona, with both models and real vessels on display. L’Aquarium is around a twelve minute walk (or a short ride on the hop on hop off bus) from Plaça Colom, in the harbour area, and is home to over 11,000 animals across both fresh water and sea water tanks. Either is worth a visit for anyone with an interest in the sea! 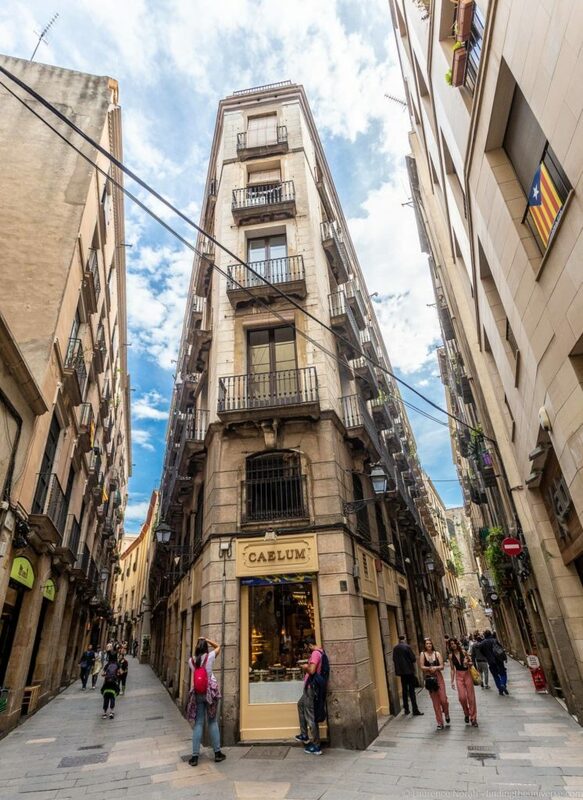 Our next stop in Barcelona in the Gothic Quarter, or Barri Gotic. 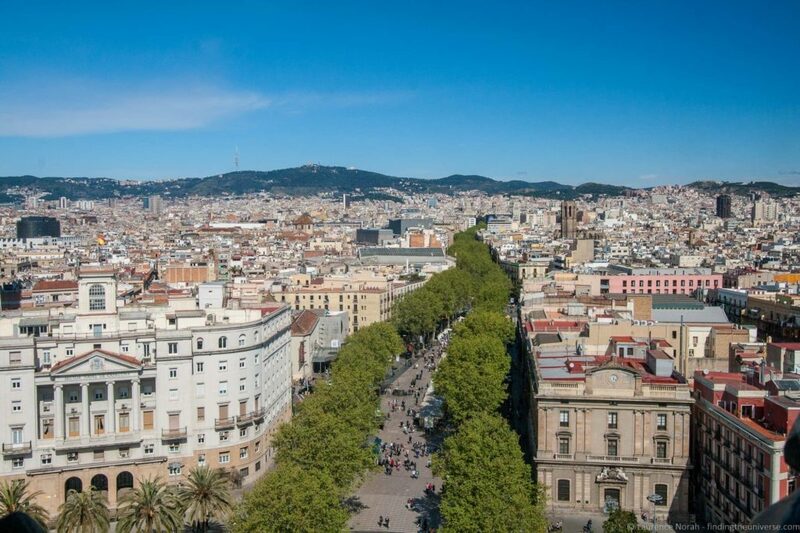 This is the heart of the old city of Barcelona, and stretches from La Rambla in the west to Via Laietana in the west, and from the seafront up to Plaça de Catalunya. The Gothic Quarter was originally built in a time before cars (although has undergone significant renovation and restoration in recent centuries), so it is largely a pedestrian only area. The narrow, maze like streets are hemmed in by four and five storey buildings, making this a fun warren to explore – although you might want to take a map, as it’s easy to get lost! Highlights of the Gothic Quarter include the spectacular Barcelona Cathedral and the UNESCO world heritage listed Palau de la Musica Catalana. In terms of getting to the Gothic Quarter, you can either walk from Plaça Colom up through the old streets to the Cathedral (around 15 – 30 minutes walk), or you can take the Hop on Hop off bus, which has a stop right next to the Cathedral. Depending on what time you arrive and how long you have in town, Casa Batlló is an optional stop for those of you keen to explore one of Gaudi’s works. The nearby La Pedrera is another option, depending on which you prefer. If you don’t have time to visit either of them, you can can at least get a good up close look at their interesting exteriors! See our full list of Gaudi sites in Barcelona for more ideas. Along with the Sagrada Familia, Casa Batlló is one of Gaudi’s most recognisable works in Barcelona. The house was commissioned to be remodelled by Josep Batlló, who had bought it in 1900, and wanted a property that looked like nothing else his family owned, and he gave Gaudi free reign to design something both audacious and creative – a challenge that an architect like Gaudi no doubt relished and rose to. The house as it stands today is pretty mind blowing, from the Venetian mask inspired balconies through to the dragon like chimney on the roof, with a number of unique and innovative features throughout. Even if you don’t decide to go inside, it’s well worth stopping here to admire the facade, although a visit inside is well worth it. Note that Casa Batlló is a popular spot for visitors, so you might want to book your ticket in advance and skip the ticket line. The recommended Barcelona Day Pass includes a 20% discount for advance bookings of Casa Batlló. We’d recommend around 30 minutes – 45 minutes here, after which you might want to grab some lunch, depending on the time. The Sagrada Familia is the most famous of Gaudi’s creations. It’s a monumental cathedral which incorporates many of his design ideas, and construction has been underway for over 100 years. Whilst not finished, it was consecrated in 2010, so is an active place of worship. A visit to the Sagrada Familia is a must for your stop in Barcelona. 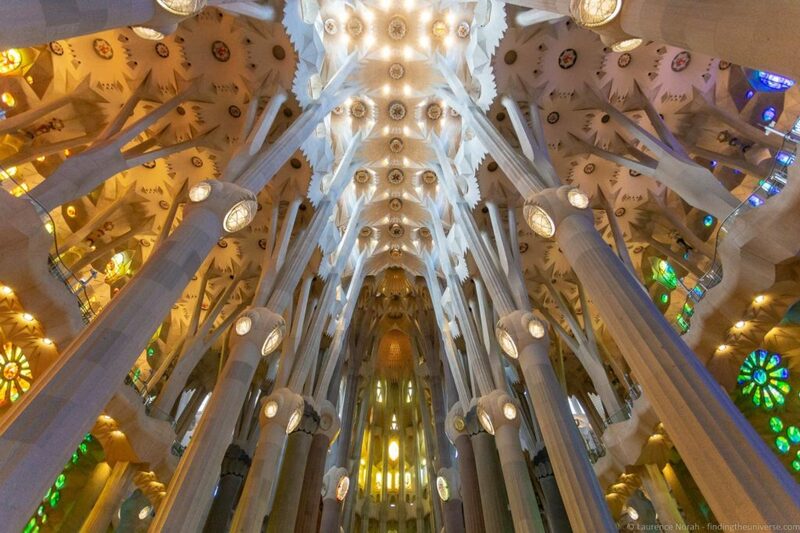 The incredible exterior and interior are unlike anything we’ve seen anywhere else in the world, and to stand inside this creation and stare up at the mighty tree like interior, almost like an organic concrete forest, is truly an awe inspiring experience. We’d also recommend investing in an audio guide to get the most out of your visit as there is a great deal of symbolism and meaning throughout the church building that you might find escapes you without an explanation. Note that the Sagrada Familia is a very popular attraction, and as such entry is on a timed entry basis. This means that you can’t just turn up and buy a ticket for immediate entry, and if you’re on a tight schedule because your boat it due to leave, it’s critical that you plan in advance. You can either purchase your ticket online in advance from the Sagrada Familia website, or, our recommended option, which is to buy a Barcelona Day Pass. This day pass has a number of benefits and cost-saving features, and also lets you specify an entry time to the Sagrada Familia on purchase. It also comes with an audioguide of the Sagrada Familia, which you can download to your smartphone, which we think is an essential add-on to getting the most out of your visit. 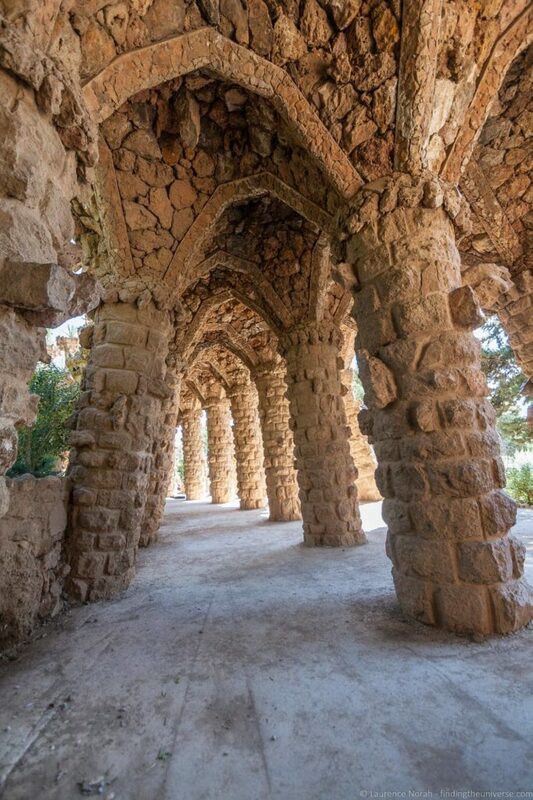 After the Sagrada Familia, we recommend you head to Park Güell another well-known Gaudi site in Barcelona. This is the next stop along on the hop on hop off bus that we recommend. It’s a bit of a way to the north, so expect to take around 15 minutes to get here. We’d advise against walking as this will take quite a while. The Hop on Hop off bus stops quite near the entrance to Park Güell, just requiring a short walk uphill to the entrance. Park Güell is a little bit different from the others Gaudi sites. Instead of being a building, it’s a large park area with a number of interesting features. The Park was originally envisioned as a luxury housing development for sixty properties, which would also include plenty of open air features and park space. The location would take advantage of the views, and also the fact that is was a little removed from the city center, thus benefiting from improved air. Unfortunately, this vision was never realised, and only two houses were ever actually built here, neither of which was designed by Gaudi. However, Gaudi did in fact live here for twenty years in one of the houses (which you can visit), and he was responsible for a great many of the features in the Park itself, including the main terrace, the column filled lower court, terrace walls, colonnaded footpaths, tiled mosaics, and more. After the Sagrada Familia, the Park Güell is one of the most popular attractions in Barcelona, and so access to the central area (known as the Monumental Core or Monumental Zone) with the majority of Gaudi’s pieces is timed and ticketed. As with the other attractions on the list, we highly recommend booking this entry in advance of your visit so as not to be disappointed. You can do this on the official website up to three months in advance of your visit. If you purchase the Barcelona Day Pass, this gives you a 20% discount on entry to the Park if you book online in advance with the code. Instructions for claiming this discount will be provided upon purchase of the Barcelona Day Pass, and you’ll also be able to book your time-slot for entering Park Güell. Just remember to leave enough time between leaving the Sagrada Familia and your Park Güell entry time to get between the two locations. More on this in the section below on getting around Barcelona. Last on our list for the day is a wander down Barcelona’s La Rambla – the famous street that runs from Placa Catalunya to the Mirador de Colón and Plaça Colom, where you’ll get the Portbus back to your cruise ship. 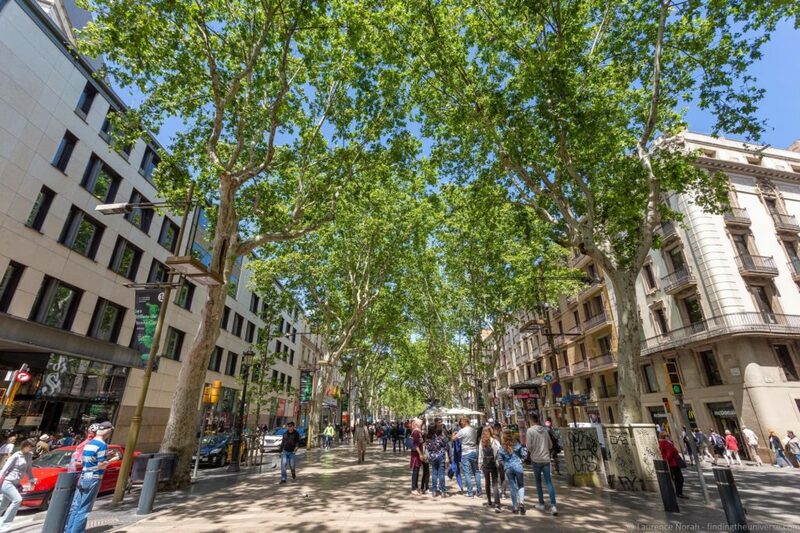 La Rambla is three quarters of a mile long, and will take you between 15 and 30 minutes to wander down, depending on how fast you walk, and how often you stop. The street was originally a stream, which separated the old city of Barcelona (now the Gothic Quarter) from the suburbs known as La Raval. Of course, the city has since expanded and the stream has been paved over, making this a large tree line boulevard with a large pedestrian walk-way down the middle. It’s filled with restaurants serving jugs of sangria and tapas, souvenir vendors, bars, and pubs. You’ll also find La Boqueria market on La Rambla, which is worth stopping in at. There’s also a a mosaic by famed artist Joan Miró on La Rambla, which makes for a good photo opportunity. 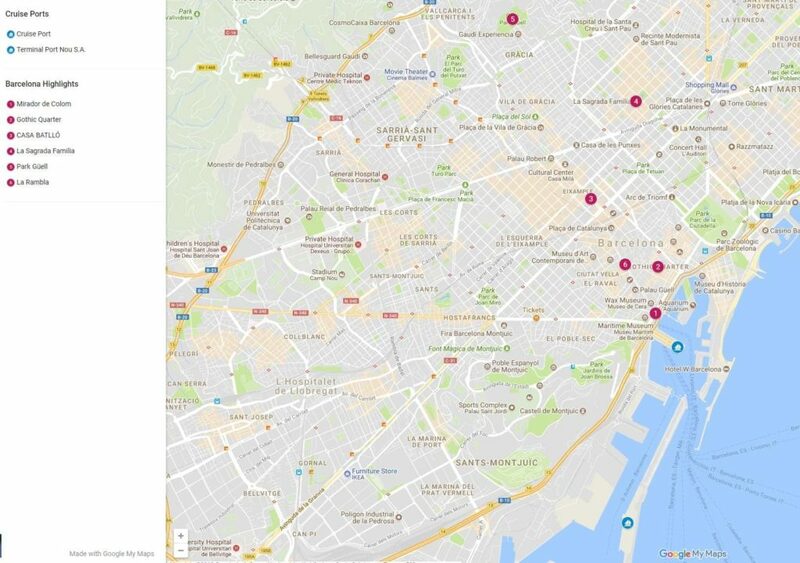 To help you visualise your day in Barcelona, we’ve put together this map which shows the main attractions, as well as the location of the cruise terminal to help you orientate yourself. You can also see this map on Google maps here. There are a number of options for getting from the various Barcelona cruise terminals to the city center. These range from walking through to private transfers or the bus. Which works for you will vary depending on which terminal you arrive at. The largest ships tend to dock the furthest away at Terminal A-D, which are around two miles from Plaça Colom. Whilst this is in theory walkable, it will take you around forty minutes each way, which will eat up a lot of your precious time for no good reason – the port isn’t exactly a scenic highlight of the city! We think the best way into the city is the Portbus. This is a dedicated shuttle service that runs between the cruise terminals and Plaça Colom. It’s not a scheduled service – rather, it runs on demand, with more services available when ships are embarking and disembarking. It stops at all the cruise terminals, and then in Barcelona at Plaça Colom, which is where you will also pick it up to get back to your ship. Portbus tickets cost €3 one way or €4 round trip. They are also included as part of the Barcelona Day Pass that we recommend. You can also book a private transfer from the port, or catch a taxi. This is definitely going to be the most expensive way to get into the city, although you will avoid more of the queues, especially if you are arriving on a larger cruise ship. There are a number of options for getting around Barcelona. Whilst the city is fairly walkable, some of the attractions, particularly the Sagrada Familia or Park Güell, will take you quite a lot of time to walk to. With this in mind, we suggest instead that you consider either taking public transport, or using the Hop on Hop off bus service. Our preference would be the latter, as this is designed to get you between all the major attractions in Barcelona, plus from the open top deck you get great views of the city, as well as an audio guide. This is definitely the most stress free way to get around, and it’s included with the Barcelona Day Pass that we recommend. The way we’ve laid out the attractions in our itinerary is also based around the hop on hop off bus route, which has a stop at all the major attractions we list, including Plaça Colom. Sightseeing discount passes are normally the best ways to save money in a city. However, most of the Barcelona passes are not well-suited for a a short visit from a cruise ship, a city pass like the Barcelona Pass, Barcelona Card or Barcelona City Pass is unlikely to generate enough savings to justify the investment unless you have more than 1 day in the city. If you are in Barcelona for more than 1 day, check out our comparison of the major Barcelona Passes to see which is best for you. 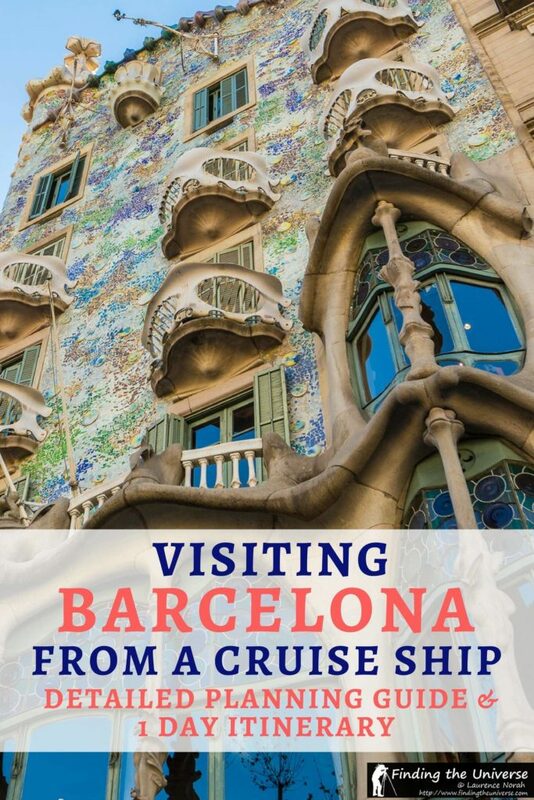 For this cruiser geared itinerary, our suggestion is to pick up a Barcelona Day Pass. 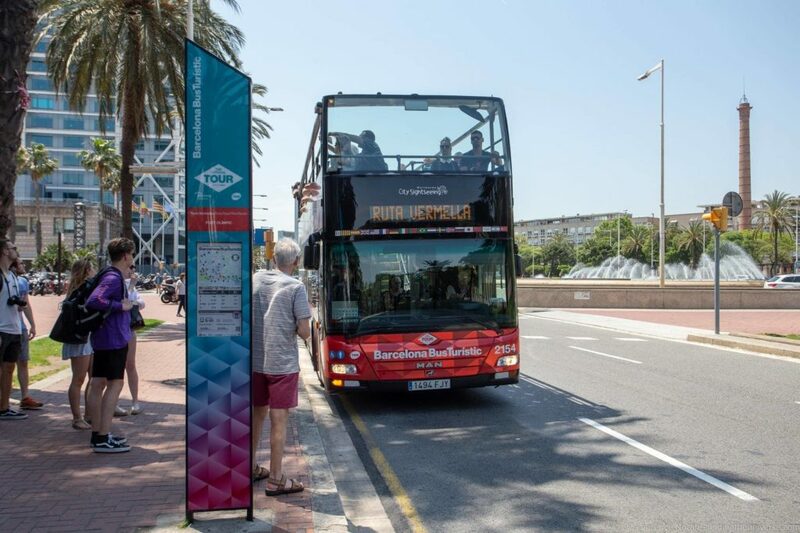 This has been specifically designed for Barcelona visitors who arrive by cruise ship, and includes the Portbus transfer, timed entry tickets for the Sagrada Familia, and Hop on Hop off bus. 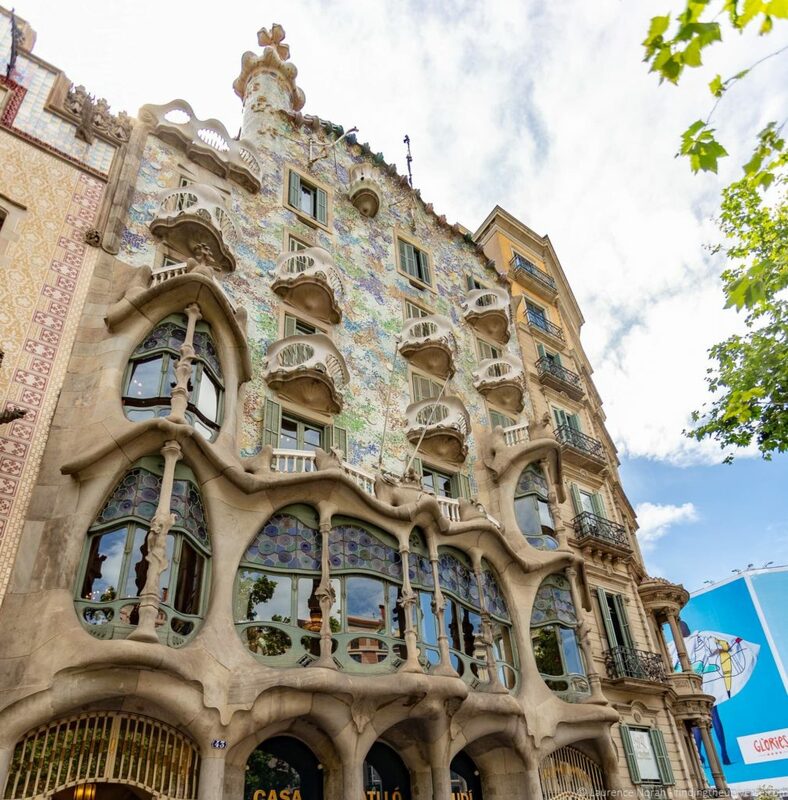 It also includes a 20% discount on some of the other highlights of the city, including Park Güell, Casa Batllo, the Barcelona Aquarium, La Pedrera (Casa Mila), the Gaudí Experience , the Picasso Museum and Barcelona Zoo. This will save you all the hassle of purchasing individual tickets for the buses, or missing the chance to see the Sagrada Familia due to the timed entry system, and means you can just focus on enjoying the day. The 20% discount means you can add in more attractions and save even more if you’re keen to see more and have the time to do so. The Barcelona Day Pass been especially designed for cruise visitors, and can only be bought online in advance of your visit. On purchase, you specify your Sagrada Familia entry time, and your tickets will be delivered electronically, ready for use. 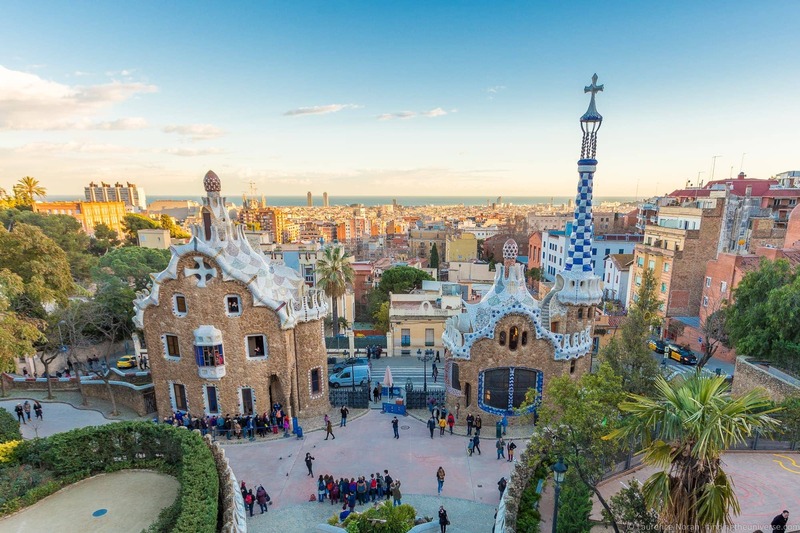 If you want to include Park Güell on your trip, the Barcelona City Card will also let you specify your time slot for that. We’d recommend you give yourself 45 minutes to an hour at Sagrada Familia, and allow for around a 15 minute journey on the Hop on Hop Off bus from the Sagrada Familia to Park Güell . So if you book a 3pm time for the Sagrada Familia, we’d suggest around a 4.30 entry at Park Güell . Of course, you need to factor in the cruise ship boarding time, and the time it will take you to get back across the city to the port. If you do decide to buy a Barcelona Day Pass, be sure to do so at least a few days before your visit as Sagrada Familia entry times can sell out several days in advance, especially in the summer months. It can take a a couple of days to process all the digital tickets for any other attractions you might want to take advantage of the discount for, including Park Guell, the Mirador de Colom or Casa Batlló. Pick up your Barcelona Day Pass now so you’re ready for your trip! Sometimes it’s nice just to not have to worry about planning and itineraries and schedules, and just let someone else take care of all the logistics for you. We’re sure that your cruise ship will have a number of shore excursions available, however we thought you would find the following specially designed tours worth checking out as well. These offer drop-off & pick-up from the cruise ship and are either private or small-group tours. We think they’re very competitively priced, and they all guarantee an on-time return to your ship. Hopefully that should give you an idea of some of the options available should you wish to arrange your own tour of Barcelona. Barcelona has developed a bit of an unfortunate reputation for having a petty crime problem, in particular, opportunistic crimes such as pick pocketing or grabbing of purses, cameras, phones, or other valuables laid out on tables. We would add that we have never had this problem on multiple visits to the city, however we are aware that it is an issue. Our advice would be just to be cautious with your belongings, to have valuables securely hidden away or on a secure strap around your neck, and not to have your wallet, phone or other valuables obviously visible in your back pocket. Think about either a money belt, a cross body travel purse, or pants that offer secure zip pockets. Basic safety precautions and being aware of your surroundings should prevent you from these issues. Avoiding carrying large sums of money on you will also help. As I said, we’ve not had any problems, so we think that by being vigilant and preparing yourself by reading up on common scams in Barcelona, you will be absolutely fine. We’ve visited Barcelona (and the Costa Brava and Pyrenees region) a number of times, and have put together a number of articles to help you plan your trip, whether you’re visiting Barcelona for a day or longer. Here are some resources we think you’ll find useful. If you want to head out of town, we have a guide to taking a day trip from Barcelona to Girona and Figueres and Salvador Dali sites near Barcelona, as well as a definitive guide to visiting the Spanish Pyrenees! And that’s it for our guide to a how to make the most of your cruise ship stop over in Barcelona! We hope you found it useful – as always, we’re happy to answer any questions or feedback in the comments below. Things to do in Girona, Costa Brava – A Detailed Guide! Hi, love your article and so much details. We will be visiting in August this year for our first time via cruise and wonder if we also wanted to visit Camp Nou, how should this be placed in your itinerary? And also the transportation, We do not mind walking around the city to see the most, but appreciated the Hop-on-Hop-off bus option as well. 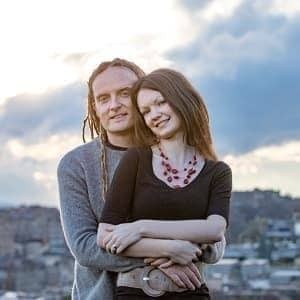 We are a family of 3 (with a 7 yo). Thanks in advance and all the best and success to your blog! So the hop on hop off bus will definitely be the easiest way to get around, this also goes on to Camp Nou after the Sagrada Familia, so that would be my suggested way of doing it. The only thing to be aware of is that access to the Sagrada Familia is timed, so you need to plan accordingly. The Barcelona Day Pass I recommend only allows entry to the Sagrada Familia after 3pm, which will not leave you enough time to see Parc Guell and Camp Nou. So you will definitely want to go a bit earlier than this. Thanks Laurence. I believe our ship arrives at 5 in the morning and leave at 6 in the evening. But I don’t think we will be in the city till 9 in the morning and usually we will be back on ship no later than 4:30. After all I guess I may have to pick Camp Nou than Park Guell. Take Hop on Hop off bus from Columbus Statue at around 9am. Book Sagrada Familia entry for 9.30. Take bus at around 10.45 on to Park Guell. Book Parc Guell tickets for 11.15. Allocate around 45 minutes to an hour at Park Guell. Thanks a lot for your reply. I thought you mentioned the Church only has 3pm and after time entry? That’s if you use the pass I recommend in the post. If you use that, it only allows you to book for timeslots after 3pm. However, you can also book activities individually, in which case you can book from 9am onwards. It’s just more expensive in the mornings to visit the Sagrada Familia, so to keep costs down and avoid confusion some passes don’t offer the morning timeslots.